About 25% of the Internet uses Wordpress and it's estimated that about 50% of Wordpress installations out there are vulnerable to security problems because they have not been updated. This is a very high number. Because I know how much work it can be to keep software updated and my own terrible track record of spending time of updating everything I'm running I kept getting increasingly frustrated with the lack of software that would allow me to run a simple website in a secure manner without having to resort to all kinds of user-unfriendly hackery. While there are many static site generators none of them really matched what I actually wanted: a content management system that just happens to run on the client. Most static website generators are too “hacker focused” in the sense that they could not be used by people without programming experiences or they are full fledged content management systems that need a server to run on or require regular maintenance for security updates. There the hacker's favorite projects like Pelican or Jekyll which support generating websites out of static files that are tracked through version control and there are CMS systems like Statamic which store all of its data in flat files — but as mentioned — needs PHP. None of those were what I was looking for. Static file generators like Jekyll are nice in a way but not just end user unfriendly, but also very limited in what you can do with them. They are more suited for building blogs than more complex sites. I tried a bunch of them and built different things with them, but ultimately always felt like something was missing. After about two years of frustration with that situation I finally sat down and spend some time working on a system to solve this problem. May I introduce: Lektor. 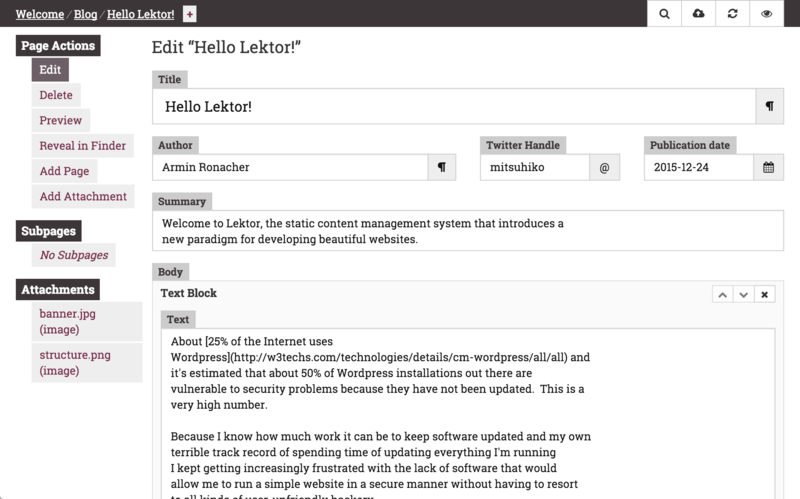 Lektor combines the experience of using a content management system like Wordpress with a static website generator like Jekyll and has some of the flexibility of a web development framework like Django. It can run locally on your computer and deploy to remote servers. All source assets are stored either in version control or Dropbox and when you are satisfied with the end results, you can push them online from the UI to a remote server. That depends on who you are. Lektor is based on the idea that there are two parties to a website: the web developers and the editors. The former create the design, layout, data layout and configures Lektor in general. The latter change the contents of the website according to the general setup. If you are a web developer you can install two versions of Lektor: you can use the command line client or if you are on a Mac, you can install the desktop version. Either version comes with a handy web interface that can be used to preview and edit all pages. 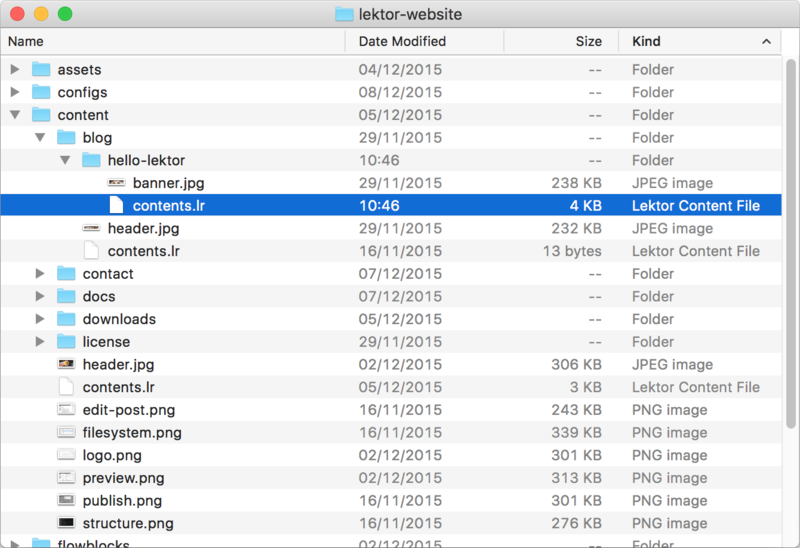 Once you have configured Lektor to your liking you can put the project into version control (or just Dropbox) and let your users modify the contents. All they have to do is to install the Desktop version of Lektor, double click the project in their Dropbox and start changing it. If you just want to edit the contents of a project you can install the Desktop version or maybe in the future use a cloud hosted version. To get an idea how it works, you can have a look at the github repository of this website which contains the project for this website and blog and have a look at the introduction documentation: Getting Started. You can also find a screencast there. You can set up data models for simple things like blog posts but also more elaborate ones if you want to build portfolio sites. For instance you could set up models for your projects and then access that data in the templates. Lektor took two attempts to get into a usable application and I'm sure that there is more that needs to be done to scratch the needs of most users. However I also know that there is no point in delaying an initial release unnecessarily. What's being released today is the application as it exists today and I think it's in a good shape to build really cool websites with it. I welcome you to give it a try and give feedback on what you think about it.